The meteoric rise of Southampton has been lauded by many as one of the truly great football achievements of our times. As recently as 2011, the 32,505-seat St Mary’s Stadium was home to a club in League One, England’s third tier. There followed successive automatic promotions, raising the Saints to the promised land of the Premier League without a moment’s pause. After a single season’s consolidation in the top division, the upward march continued, with consecutive eighth- and seventh-place finishes. It was as if this haloed club were blessed. The Mail were not alone in highlighting the sudden exodus of players from the Saints as the club’s fans wailed at the injustice of the mass departure, certain that their club would be unable to escape relegation as a result. But in actual fact, there was a bit of conflation by the media. Both Schneiderlin and Clyne moved in different balance-sheet years, meaning that the reported sales figure should not have been the £135.5 millio reported but instead should have been closer to £100 million. But as it turns out, this would still have been inaccurate. Southampton’s sales generated substantially less cash than that. In fact, according to figures released for the first time in Southampton’s accounts published last week, the club received £29.9 million in player sales during 2014-15. A further £29.8 million is due to them over the course of this season and another £25 million will be receivable in future seasons. 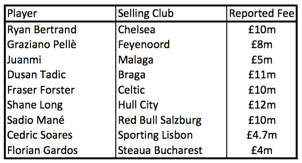 It means that the sales of the players in the above table (bar Clyne and Schneiderlin) did not in fact raise c£100 million but instead only £84.7 million in total. That’s still an awful lot of cash to raise in one 12-month period, but is still about 14% down on what the media reported that summer. But where the media were most wrong was on the other side of the ledger. Do a Google search for any of the Saints’ player purchases over the course of that year alongside the word “bargain” and there’s a report somewhere about how cheaply they acquired the above players’ replacements. This business all came to a reported £74.7 million. According to the media, the Saints had made a £25m trading profit and still finished a place above their previous season’s return. The truth, though, is different. As it happens Southampton spent £61.0 million in cash on incoming transfers in the 2014-15 season, netting out at £31.0 million after player sales. Moreover they owed a further £22.1 million over the course of this season and £21.2 million in seasons to come. The total committed transfer spend was therefore £104.3 million, offset by only £84.7 million of guaranteed transfer receipts. The narrative that this was a club lifted by wingèd angels is, therefore, quite wrong. The truth about what powered the Saints’ rise up the leagues is more prosaic than that, as it does not merely apply to the 2014-15 season alone. 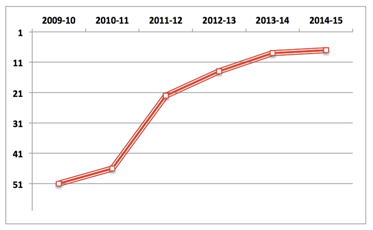 The story was the same in 2012-13, when £21.4 million of net transfer spending was made, and in 2013-14, when there was £19.0 million of transfer expenditure after sales. Far from being the selling club everyone would believe, Southampton has been a strong net investor for years. But these numbers do not mean a great deal without the context of what was going on at their peers. That can clearly be seen from the chart below, which adds the amounts committed in wages and on net transfer spending to give the overall football investment at each Premier League club for the most recent season in which data are available. Southampton did extremely well to finish in eighth place in 2013-14, but their achievement was not the best in the Premier League. That accolade lay with Everton. Indeed, there is a strong argument that Stoke City’s and Newcastle United’s ninth- and 10th-place finishes – indeed even Crystal Palace’s in 11th – were stronger achievements than Mauricio Pochettino’s in the same season. Certainly they did not enjoy the investment of Southampton. However, what the club did achieve strategically was very clever. Among the players they replaced was an ageing centre forward, Rickie Lambert. His departure part-financed the signing of two younger men, Pellè and Mané, who contributed 22 goals between them in their first season together. They have already produced nine between them in a 12 matches this campaign. The other area of the spine Southampton addressed was to bring in a goalkeeper who, though now out with a serious knee injury, has a strong prospect of being England’s first choice in future seasons. Moreover Southampton were rid of players they might have found difficult to keep content were they to deny them the opportunity to play at Champions League clubs (as Liverpool then were). What they also did was to add £16.5 million to the wage bill, or another 27.7%, raising it to a size commensurate with that of one of the top-10 clubs in England. There was also another £6.3 million spent at the club’s new £38 million training ground development, which at the end of June was close to completion, something that will underpin what the club describes as “the player-development business model”. But what was most pressing of all had been the club’s net current liabilities. Through their judicious financial management, Saints reduced their immediate net debts to a manageable £15.1 million from what had been in 2013 an eye-watering £52.6 million. Even while in the Premier League last season it required an emergency £20 million bridging loan from the owner, Katarina Liebherr, to keep the wolves from the door. Many would not have expected that as rumours swirled of her disinterest when she was forced instantly to take over the club upon the death of her father. Even so, had Southampton been relegated with those liabilities hanging over them, it is reasonable to think another administration might have loomed, whereupon a return to the underworld of England’s lower leagues would have beckoned. That it never came to pass is no miracle. But the fact they have Liebherr as their club’s owner and an excellent board looking after her asset is something Saints fans should certainly count as a blessing. Journalist and broadcaster Matt Scott wrote the Digger column for The Guardian newspaper for five years and is now a columnist for Insideworldfootball. Contact him at oc.ll1556265280abtoo1556265280fdlro1556265280wedis1556265280ni@tt1556265280ocs.t1556265280tam1556265280m.